WHAT IS THE DAWGGIE GOPAK? The Dawggie GoPak is designed with portability in mind. It is just the right size to be useful but not so large that it gets in the way. Simply hover your mouse cursor over the plus signs below to learn more about the various features. You can use your finger or a stylus to tap the plus sign if on a mobile or a touch-screen device. 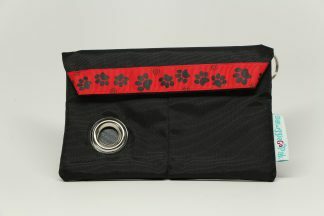 It is easy to enjoy outdoor activities with you dog and not have to worry about leaving items behind. 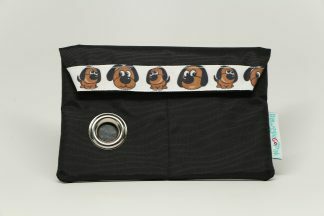 Here is a look at some of the main features of the Dawggie GoPak. 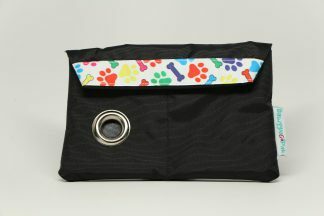 The Dawggie GoPak is available in several popular colors such as black, red, pink & purple. 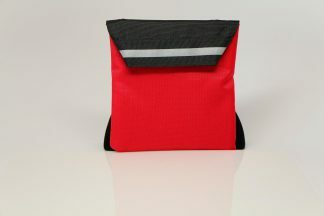 Black and red are our most popular colors followed by pink and purple. Many design options are available. 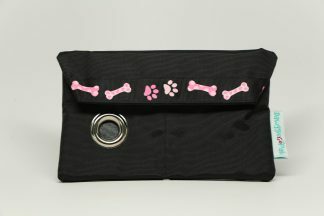 Choose ribbons ranging from paws to bones to dogs to sandals. We plan to release a “create your custom GoPak” option soon. 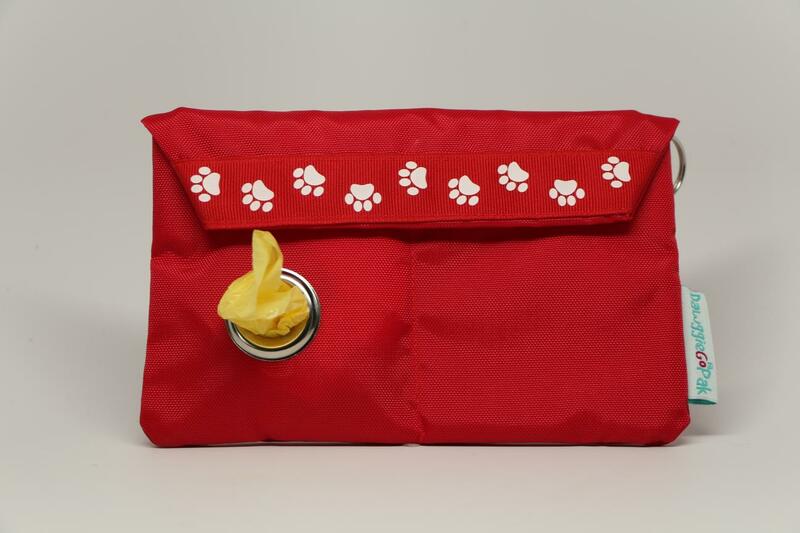 Dawggie GoPaks are hand-made from easy to clean, water-resistant lightweight denier nylon fabric for durability. 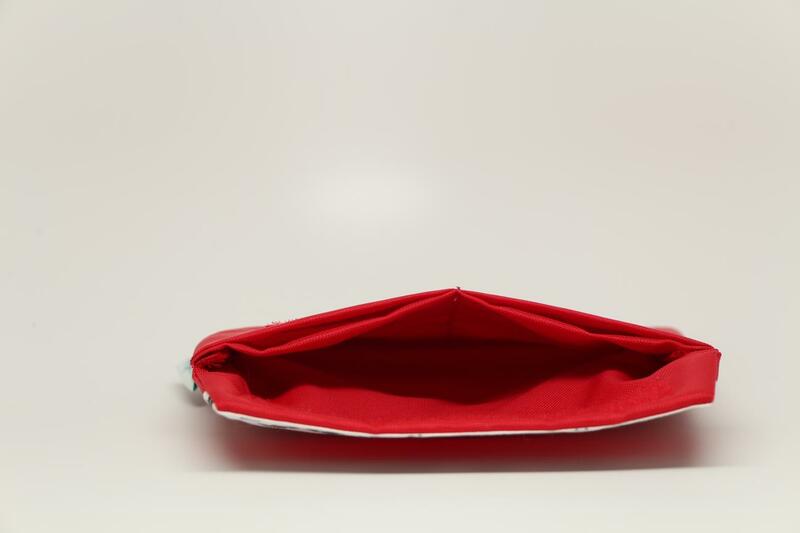 Each GoPak weighs less than 3 ounces! 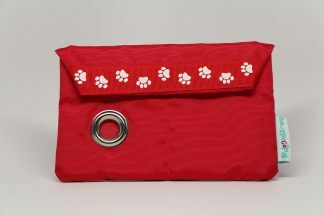 Front and rear pockets to hold your belongings: keys, mobile phone, dog treats, wipes and more. You can also clip a flashlight or micro-light for those night walks! 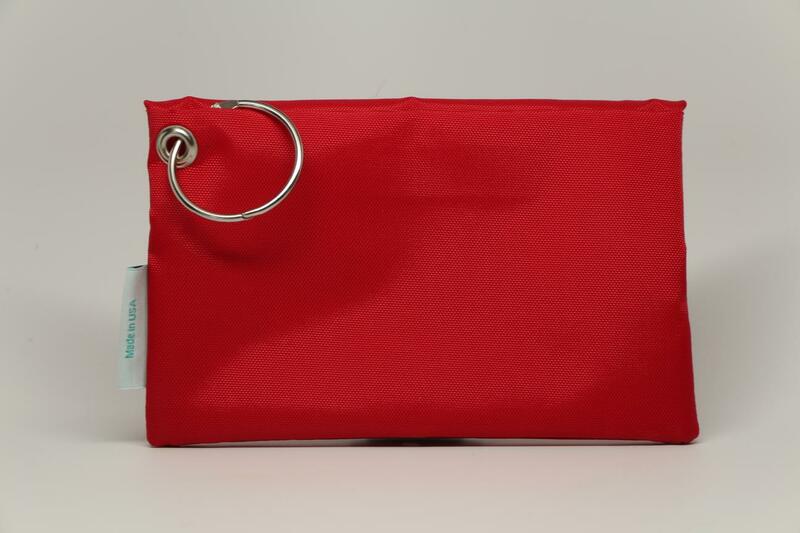 Each GoPak comes with a built-in waste bag dispenser that holds a standard 14 or 20 count roll of waste bags so you are never caught off-guard! 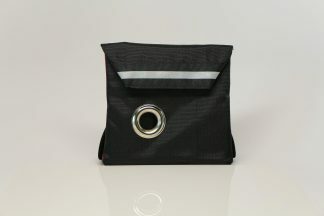 The front flap and rear pocket feature strong Velcro fasteners that keep your belongings safe and secure. Velcro is color-matched to the base color of the GoPak. Easily clips to your leash with the included locking o-ring. 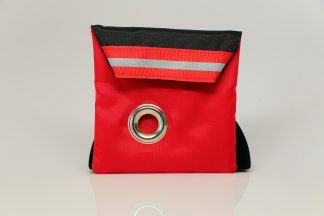 Additional fastening options from NiteIze are also available. Please view the products page for details.